Coconut, seeds, fruit, nuts, dark chocolate, the works! I'm back, and baking again. I know! I know! Last year, as part of a Christmas gift from my cousin Samantha, she gave me a mason jar filled with all of the dry ingredients for these cookies, as well as the recipe to make them. I am always amazed by how good at beautiful, creative, crafty things some people can be. And this person in particular is actually a member of my family! The creative gene must have skipped me, along with the thick hair and blue eyes genes. Sigh. My cousin Samantha (left), my brother Braeden (top middle), me (right), and my cousin Darryl (bottom middle). Clearly I am not in on the joke. I hope it's not about my pyjamas. I've made these cookies at least half a dozen times, because they are just so, so yummy. I like how there is no flour or added sugar in the recipe, which makes me feel like they are in some way healthy. Instead of eggs or sugar or butter, bananas are used to add moisture and sweetness. Save these for banana bread instead. I've tried the recipe with both fresh bananas, and with the black, scary, bananas at the back of my freezer, and definitely fresh is the way to go. A potato masher will get those fresh bananas just as mushy as if you had used the over-ripe freezer bananas, without the strong taste. 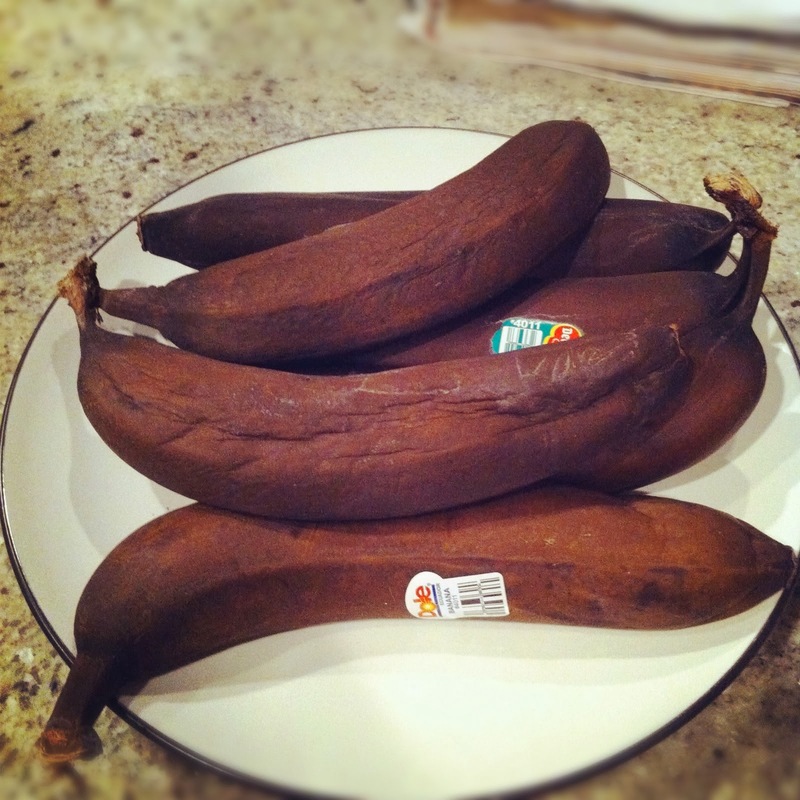 Save those black bananas for banana bread. Let's discuss the elephant in the room - dried fruit is disgusting, yes? Yes. 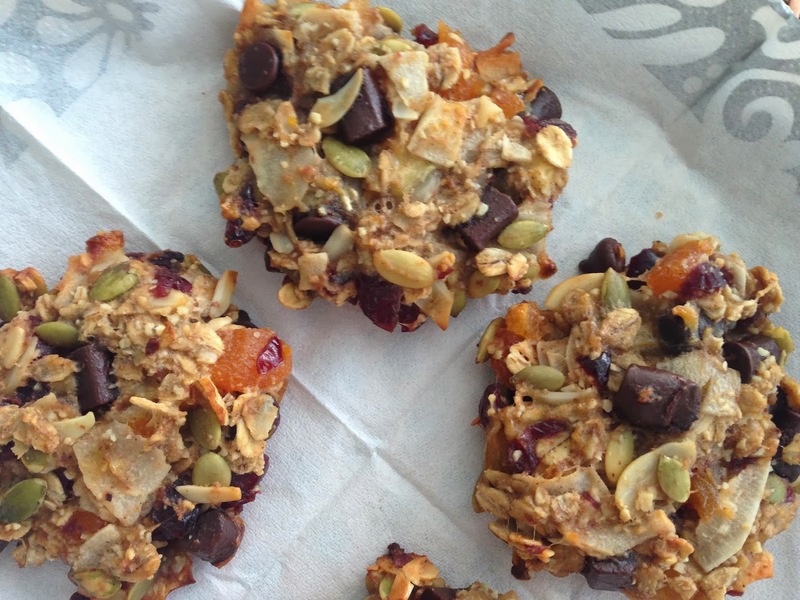 But for some reason, in these cookies the dried cranberries, apricots, cherries, or whatever combination of dried fruit that you decide to use, just totally makes the cookies. Some things in life just cannot be explained. Look at all the good stuff in these cookies! Including the dried fruit! Here's Bob and his intense stare again, this time on his Wheat Free Rolled Oats. "Quick Bob - staring contest, me and you...you win, you always do." I like to pop one of these cookies into my lunch bag for a mid-morning or late afternoon snack instead of a packaged granola bar. 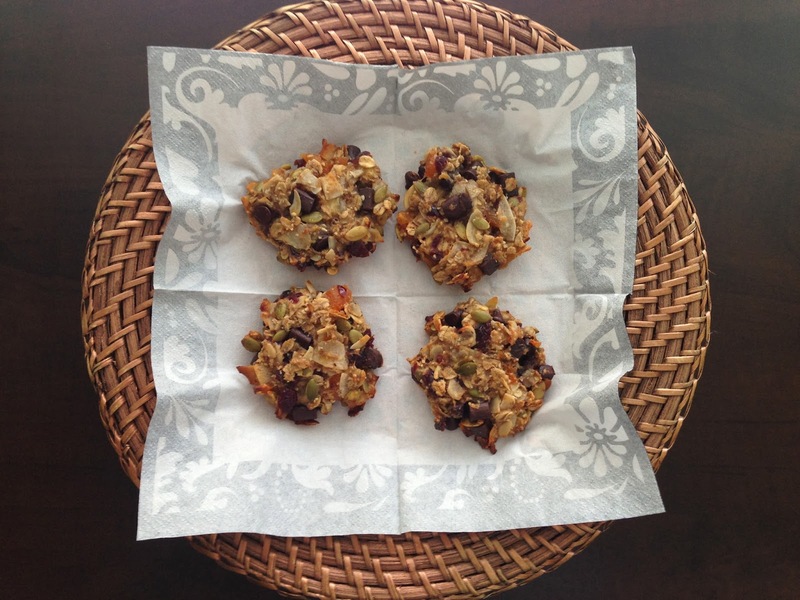 At about 150 calories each, they pack 4 grams of protein, 10 grams of iron, and 4 grams of fibre into each cookie. Plus they are delicious! Oh, and speaking of Cookies...these Cookies and Cream Cheesecake Bars are basically the best things ever. Ev-er. 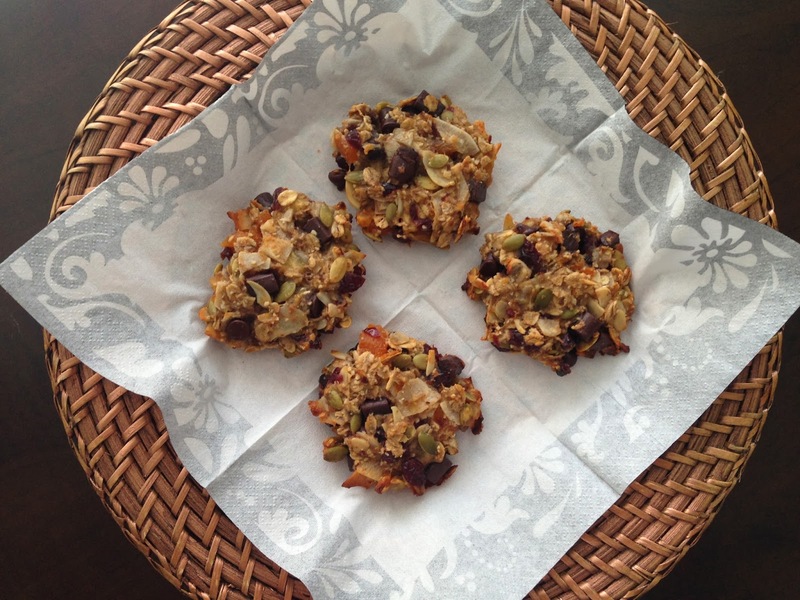 Back to the Healthy Everything Cookies - the recipe is below! Note on how to make your own almond meal: You can buy almond meal in the natural foods aisle, but it's also really easy to make it yourself. Simply put almonds into a food processor and pulse until the almonds are powdery. For this recipe, you can use the almond meal this way, or you can use a fine mesh strainer to strain out the larger bits of almond and leave yourself with just the fine powdery stuff. In a large bowl, place peeled bananas, vegetable oil, and vanilla extract. Using a potato masher, mash contents of the bowl together until very mushy (there will still be lumps). Still lumpy, and that's ok.
Chop the dried fruit into small pieces, and add to the bowl. Add rolled oats, coconut flakes, chocolate chunks, almond meal, almonds, pumpkin seeds, cinnamon, and all-spice. Using your hands or a wooden spoon, mix everything together throughly. Line a baking sheet with parchment paper. Using your hands, form small balls of cookie dough, place onto the baking sheet, and press down gently to flatten the dough. Place into the oven, and bake for 25 - 30 minutes, or until the tops of the cookies begin to brown. Remove cookies from oven, allow to cool slightly on the baking sheet, then place the cookies on a wire rack to cool completely. Enjoy! Recipe Source: My cuz Samantha. can"t wait to make these! thanks megan! !